Cross-coupling reactions of trifluoroborate salts are palladium-catalyzed reactions that result in the coupling of an electrophilic organic halide or pseudohalide and a nucleophilic trifluoroborate. Trifluoroborates offer several advantages over boronic acid nucleophiles, which have traditionally been employed for the Suzuki-Miyaura reaction. The Suzuki-Miyaura reaction involves the palladium-catalyzed cross-coupling of an electrophilic halide or pseudohalide with a nucleophilic organoboron compound. Traditionally, boronic acids have been used as nucleophiles in this reaction; however, many boronic acids suffer from problems associated with protodeboronation and instability. Potassium trifluoroborate (TFB) salts can mitigate these issues by serving as stable, protected forms of boronic acids. In the presence of a protic solvent and a base, TFBs are slowly hydrolyzed, forming boronic acids active in cross-coupling. A wide variety of TFBs have been prepared and used successfully in cross-coupling reactions (Eq. 1). Potassium trifluoroborate salts may be synthesized directly from the corresponding boronic acids (and other organoboron derivatives) by treatment with KHF2. Their straightforward synthesis, functional group tolerance, ease of handling, and enhanced stability relative to boronic acids have made TFBs popular nucleophiles for cross-coupling reactions. The mechanism of Suzuki-Miyaura cross-coupling with TFBs likely involves the same general steps as other cross-coupling reactions. Reduction of a palladium(II) precatalyst produces the active catalyst, a Pd(0) species. Oxidative addition of the electrophile to this complex results in an organopalladium(II) complex, which reacts with the organometallic nucleophile in a transmetalation step to afford a diorganopalladium(II) intermediate. Reductive elimination from this intermediate yields the coupled product and regenerates the palladium(0) catalyst (Eq. 2). The rate of oxidative addition is typically independent of the nucleophile, and cross-couplings with TFBs are no exception. However, oxidative addition may be the turnover-limiting step of the catalytic cycle, so considerable attention has been paid to this step. Electron-rich ligands accelerate oxidative addition by increasing electron density at the palladium center. Futhermore, bulky ligands accelerate oxidative addition by encouraging the formation of 12-electron [LPd(0)] species, which undergo oxidative addition more rapidly than [L2Pd(0)] species. The mechanism of activation of palladium(II) precatalysts is unique when potassium trifluoroborates are employed. Unlike many cross-coupling reactions, homocoupling of the nucleophile with reduction of the palladium(II) catalyst does not occur. Instead, fluoride anion present in the reaction mixture mediates the reduction of palladium(II) to palladium(0) via the mechanism shown in Eq. 3. From the perspective of the trifluoroborate, transmetalation is the most important step of the catalytic cycle. Boronic acids require base to transfer their organic group to palladium, and transmetalation occurs via a bridging hydroxyl group (Eq. 4). Notably, trifluoroborates must be fully hydrolyzed to the corresponding boronic acids (or boronate esters) before transmetalation can take place. Presumably, transmetalation from boronic acids or esters generated in situ from trifluoroborates occurs as in Eq. 4. Like oxidative addition, the reductive elimination step is independent of the nature of the trifluoroborate. The two organic groups that eliminate must be cis to do so; bidentate phosphine ligands with wide bite angles have been employed to position the organic groups cis and close to one another. 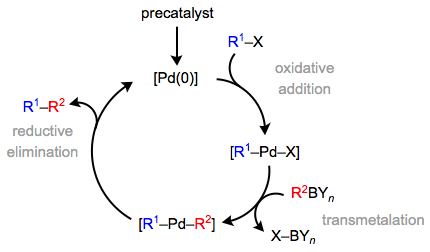 Like oxidative addition, reductive elimination is faster from [LPd(II)R2] species than from [L2Pd(II)R2] species. For this reason, bulky, monodentate phosphine ligands encourage reductive elimination and have emerged as a popular ligand class for these reactions. Stereospecificity is the norm in cross-couplings of stereodefined alkenyl trifluoroborates. Reactions are also typically stereospecific with respect to stereodefined alkenyl electrophiles. However, unoptimized reaction conditions may result in a loss of stereochemical integrity. The stereospecificity of the reaction permits the synthesis of conjugated dienes of well-defined stereochemistry, as in Eq. 5. The scope of cross-coupling reactions of trifluoroborates is extraordinarily broad. Electron-rich and -poor trifluoroborates associated with sp-, sp2-, and sp3-hybridized carbons have been used with success; however, isolated limitations of these reagents do exist. This section highlights representative examples of the scope and limitations of cross-coupling reactions of trifluoroborate salts with electrophiles. Aryl TFBs are the most common class of nucleophiles employed in these reactions. Virtually all substitution patterns and all manner of electron-donating and -withdrawing substituents have been successfully incorporated into aryl TFBs, although sterically hindered substrates with ortho substitution often react sluggishly. Whereas electron-poor aryl and heteroaryl boronic acids are often subject to protodeboronation, aryl TFBs with electron-withdrawing substituents (and TFBs in general) are resistant to this problematic side reaction (Eq. 6). Alkenyl TFBs also exhibit a wide scope in cross-coupling reactions. Of particular note is vinyl trifluoroborate, a vinylation reagent that has seen wide application in synthesis (Eq. 7). The corresponding boronic acid polymerizes rapidly. Alkynyl TFBs may be employed in cross-coupling in a complementary method to the Sonogashira reaction. Protodeboronation of alkynyl TFBs can be a problem, so protic solvents should be avoided. Although ethynyl TFB is not suitable for monocoupling, TMS-ethynyl TFB can be used to install the ethynyl group after removal of the silyl protecting group (Eq. 8). Primary alkyl TFBs and methyl TFB work very well in cross-couplings with a variety of electrophiles. Functional group tolerance in the nucleophile is substantial: carbonyls, alkenes, and even epoxides are tolerated. Conditions have been developed for cross-coupling of secondary alkyl TFBs (Eq. 9), but like many cross-coupling reactions of secondary nucleophiles, these reactions are often plagued by β-hydride elimination. Elimination followed by re-insertion of alkene into the palladium-hydrogen bond can result in the formation of constitutional isomers of the desired product. Alkyl TFBs that lack β-hydrogens do not suffer from problems associated with β-hydride elimination. For example, aminomethyl TFBs have been used in cross-coupling reactions with aryl electrophiles (Eq. 10). Aryl diazoniums and iodoniums were the first electrophiles employed in cross-coupling in conjunction with trifluoroborate nucleophiles. Although yields are sometimes modest, these electrophiles react selectively in the presence of halides (Eq. 11). Aryl halides and pseudohalides are very commonly used as electrophiles in couplings with TFBs. Aryl iodides are the most reactive substrates, followed by bromides and chlorides. As a general caveat, conditions developed for less reactive electrophiles (such as aryl chlorides) are rarely also suitable for more reactive electrophiles (such as aryl iodides). This situation occurs because changing the nature of the electrophile may change the turnover-limiting step of the reaction. Furthermore, substrates containing both bromides and triflates may suffer from selectivity issues resulting in diminished yields (Eq. 12). Among alkenyl electrophiles, alkenyl bromides are most commonly employed (Eq. 13). In general, the scope of alkenyl electrophiles is more limited than that of aryl electrophiles. For example, alkenyl chlorides have not yet been employed successfully in cross-coupling with TFBs. Among sp3-hybridized electrophiles, allylic or benzylic halides may be coupled with aryl, heteroaryl, and alkenyl TFBs. For example, benzyl chloride reacts efficiently with aryl trifluoroborates (Eq. 14). The functional group tolerance and enhanced stability of trifluoroborates have resulted in their extensive use in organic synthesis. They are commonly employed when cross-coupling of the corresponding boronic acid fails, as in Eq. 15. Kumada coupling conditions were also ineffective for this transformation. In a series of syntheses of the serofendic acids, cross-coupling of an alkenyl bromide and vinyl trifluoroborate was used to establish a stereodefined, conjugated diene, which then took part in a Diels-Alder reaction (Eq. 16). Although the direct comparison of distinct cross-coupling methods is difficult, some general statements can be made about the relationship of the Suzuki-Miyaura reaction to other cross-coupling methods. Many cross-coupling reactions, such as the Kumada and Negishi couplings, are significantly hampered by limited air stability of the organometallic nucleophile. Organostannanes are for the most part air stable; however, the byproducts of Stille coupling are environmentally harmful and toxic. Hiyama-type couplings of organosilanes have emerged as environmentally friendly alternatives. Organoboron compounds are similarly environmentally friendly; however, straightforward syntheses of organoborons via hydroboration and C-H activation reactions have made the Suzuki-Miyaura reaction extremely popular. The limitations of boronic acids are well recognized, and a variety of protected organoboron compounds have thus emerged to address the challenges associated with boronic acids. Tricoordinate boronate esters and boronic acids are susceptible to decomposition under a variety of conditions; however, quaternized boron does not suffer from the same lability. Hence, many protected organoboron compounds incorporate a Lewis base and quaternization of the boron center. Quaternization may also obviate the need for base during the cross-coupling reaction. Sodium trihydroxyborates, for example, may be obtained by treating boronic acids with sodium hydroxide. The resulting "ate" complexes do not require base to undergo cross-coupling (Eq. 17). MIDA boronate esters include a chelating ligand with a Lewis basic nitrogen positioned well to interact with the empty orbital on boron. The boronate itself can be carried through a round of cross-coupling with a separate boronic acid (Eq. 18), and MIDA boronates can be subjected to chromatography (unlike trifluoroborates). Removal of the MIDA group affords a boronic acid, which can undergo cross-coupling. MIDA boronates are limited by their poor atom economy and the need for additional protection/deprotection steps. Optimized reaction conditions for any cross-coupling reaction, including those of trifluoroborates, depend profoundly on the nature of the substrates. Thus, the establishment of a single "best" set of conditions is impossible. Although trial-and-error has traditionally been employed to determine ideal conditions, more recent high-throughput methods have the potential to accelerate reaction development. In general, reactions should be carried out under inert atmosphere. For all but the most reactive of electrophiles, elevated temperatures are required. The use of palladium(II) precatalysts is preferred to palladium(0) catalysts, as the latter are unstable in air. For very simple substrates, ligandless conditions can be employed, but most substrates require either chelating phosphine ligands or bulky, monodentate phosphines. A hydroxylic solvent or cosolvent is necessary to facilitate transmetalation from the trifluoroborate; consequently, reaction mixtures often begin heterogeneous but become homogenous as the reaction proceeds. Deoxygenated solvents are recommended to prevent oxidation of the catalyst and ligand. The most common bases employed are carbonates (in non-polar solvents) and amine bases (in protic solvents). To a mixture of potassium (E)-(4-phenylbut-1-en-1-yl)trifluoroborate (261.9 mg, 1.10 mmol), 2-bromo-3-methyl- cyclopent-2-enone (175.02, 1.00 mmol), Cs2C3 (977 mg, 3.00 mmol), Pd(OAc)2 (11 mg, 0.05 mmol), and PPh3 (26 mg, 0.1 mmol) was added THF–H2O (10:1, 4 mL). The reaction mixture was heated at 70 °C with stirring under a nitrogen atmosphere for 2 h, cooled to rt, and diluted with H2O (3 mL). The resulting mixture was extracted with Et2O. The organic layers were combined and washed with 1 N HCl and brine, dried (MgSO4), and then filtered. The solvent was removed under vacuum, and the crude product was purified by silica gel chromatography (hexane) to afford the title compound (215.0 mg, 95%): IR (neat) 3025, 2918, 2852, 1625 cm–1; 1H NMR (500 MHz, CDCl3) δ 7.27 (t, J = 7.5 Hz, 2H), 7.20–7.15 (m, 3H), 6.75 (dt, J = 15.8, 6.7 Hz, 1H), 6.08 (d, J = 15.8 Hz, 1H), 2.75 (t, J = 7.3 Hz, 2H), 2.49–2.44 (m, 4H), 2.39–2.38 (m, 2H), 2.08 (s, 3H); 13C NMR (125.8 MHz, CDCl3) δ 208.2, 169.6, 141.9, 135.3, 134.8, 128.4 (2C), 128.3 (2C), 125.8, 119.3, 35.9, 35.7, 34.8, 31.5, 17.5; HRMS–CI (m/z): M+ calcd for C16H18O, 226.1357; found 226.1348. ↑ Echavarren, A. M.; Cardenas, D. G. Metal-Catalyzed Cross-Coupling Reactions, 2nd ed. ; Wiley-VCH: Weinheim, 2004. ↑ Butters, M.; Harvey, J.; Jover, J.; Lennox, A.; Lloyd-Jones, G.; Murray, P. Angew. Chem., Int. Ed. 2010, 49, 5156. ↑ Lennox, A. J. J. Lloyd-Jones, G. C. J. Am. Chem. Soc. 2012, 134, 7431. ↑ Matos, K.; Soderquist, J. A. J. Org. Chem. 1998, 63, 461. ↑ Marcone, J. E.; Moloy, K. G. J. Am. Chem. Soc. 1998, 120, 8527. ↑ Barder, T. E.; Buchwald, S. L. J. Am. Chem. Soc. 2007, 129, 12003. ↑ Alacid, E.; Nájera, C. J. Org. Chem. 2009, 74, 2321. ↑ Molander, G. A.; Yokoyama, Y. J. Org. Chem. 2006, 71, 2493. ↑ Molander, G. A.; Biolatto, B. J. Org. Chem. 2003, 68, 4302. ↑ Adonin, N. Y.; Babushkin, D. E.; Parmon, V. N.; Bardin, V. V.; Kostin, G. A.; Mashukov, V. I.; Frohn, H.-J. Tetrahedron 2008, 64, 5920. ↑ a b Molander, G. A.; Felix, L. A. J. Org. Chem. 2005, 70, 3950. ↑ Molander, G. A.; Katona, B. W.; Machrouhi, F. J. Org. Chem. 2002, 67, 8416. ↑ Dreher, S. D.; Dormer, P. G.; Sandrock, D. L.; Molander, G. A. J. Am. Chem. Soc. 2008, 130, 9257. ↑ Molander, G. A.; Gormisky, P. E.; Sandrock, D. L. J. Org. Chem. 2008, 73, 2052. ↑ Xia, M.; Chen, Z.-C. Synth. Commun. 1999, 29, 2457. ↑ Molander, G. A.; Petrillo, D. E.; Landzberg, N. R.; Rohanna, J. C.; Biolatto, B. Synlett 2005, 1763. ↑ Molander, G. A.; Fumagalli, T. J. Org. Chem. 2006, 71, 5743. ↑ Molander, G. A.; Elia, M. D. J. Org. Chem. 2006, 71, 9198. ↑ Singh, R.; Czekelius, C.; Schrock, R. R.; Muller, P.; Hoveyda, A. H. Organometallics 2007, 26, 2528. ↑ Toyota, M.; Asano, T.; Ihara, M. Org. Lett. 2005, 7, 3929. ↑ Krasovskiy, A.; Duplais, C.; Lipshutz, B. H. J. Am. Chem. Soc. 2009, 131, 15592. ↑ Cammidge, A. N.; Goddard, V. H. M.; Gopee, H.; Harrison, N. L.; Hughes, D. L.; Schubert, C. J.; Sutton, B. M.; Watts, G. L.; Whitehead, A. J. Org. Lett. 2006, 8, 4071. ↑ Struble, J. R.; Lee, S. J.; Burke, M. D. Tetrahedron, 66, 4710.